Quiz Bird #2 Revealed/La Respuesta del Prueba #2! Quiz Bird #2 had nine entries, two of which were correct: Lesser Goldfinch (Carduelis psaltria). Lesser Goldfinch photographed by Jo Davidson. Our Official Winner is Suzanne Gross of Piedades, Santa Ana, who came on one of our walks at the Wilson Garden last December. Due to the difficulty of mailing cookies from San Vito, Suzanne has generously donated her one dozen Chocolate Chips to our next Bird Walk at the Wilson Garden. 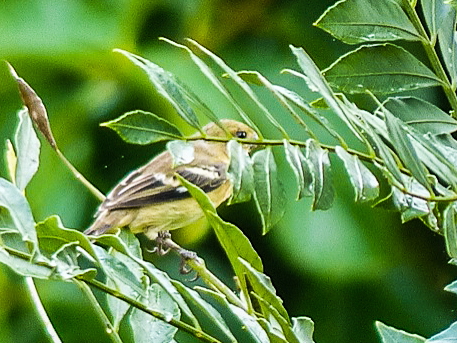 Other entries included two orioles, two tanagers, a vireo, a warbler and a seedeater. Thanks for a great job Photographer Jo Davidson on making sure the bill was hidden behind a leaf: we fooled everybody except Suzanne and member Jim Zook. Gracias a nuestra miembre Jo Davidson para su foto de un Carduelis psaltria! Tuvimos mas respuestas este vez, pero solo dos de nueve estaban correctos. Felicidades a Suzanne Gross de Piedades, Santa Ana: su respuesta estaba correcto: Lesser Goldfinch! This entry was posted in Special Event Reports and tagged Birding San Vito, Carduelis psaltria, costa rica, free bird walks, Lesser Goldfinch, OTS Las Cruces, Quiz Bird Contest, Wilson Botanical Garden by AWOlivieri. Bookmark the permalink.